Discussions of Heathen shamanic, magic, and divination practices in a modern context. GOTW promotes and welcomes inclusive Heathenry and stands against racist and bigoted ideals & practices. Supporting Declaration 127. Jan goes solo in this episode to share the growing world-wide tradition of Väntljusstaken/Sunwait Candle lighting. This is a revitalizing of the advent wreath candles with a Heathen/Pagan purpose to help bring in the Yule time. 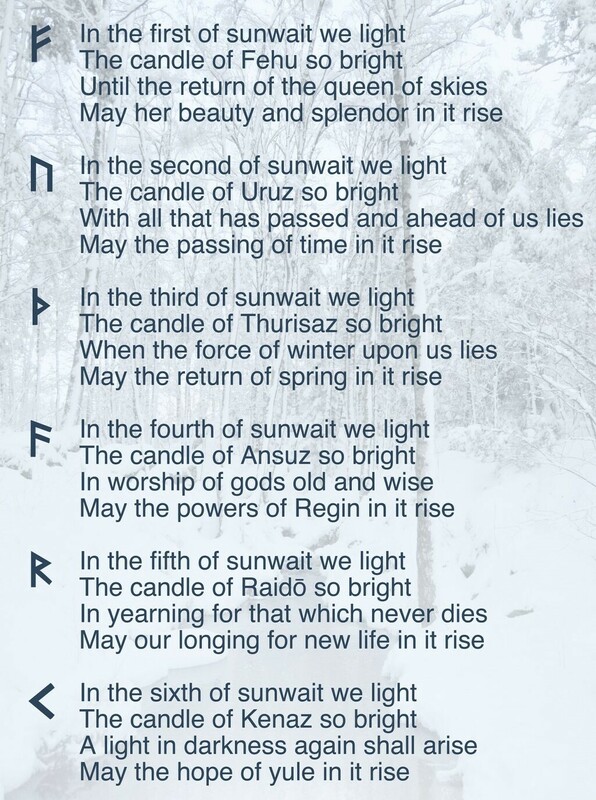 The Sunwait candleholder has six candles to be lit the six Thursdays (or fridays/other day of the week, or even the 5 days prior to Yule) leading up to the winter solstice. Any six-armed candleholder will do, and you decorate it as you wish. Many use the first runes of the Futhark to mark the candles and manifest their runic power for the meditation and into the coming season/year. There is a poem to go with the lighting of each candle here in English, but also on the website in Swedish, French, German and Dutch. Post photos of your candles and your experiences setting the intentions during this on Gifts of the Wyrd Facebook group and @Väntljusstaken Facebook page. Check back to for a possible addition of the Swedish version of the poem. Please leave feedback on iTunes. This helps the podcast to be found easier. Music: To Hear the Trumpets Call (intro) and Apple Seed Seduction by Hauk Heimdallsman. Hauk's music is currently on Bandcamp and you can find him on Facebook @HaukMusic. Hauk was interviewed on episode 5. All music selections on this podcast are written, produced, and copywritten by their respective creators/owners. They are used with permission. Logo Created by Xander Folmer of Huginn's Heathenhof. Contact Xander for logo designs for all your needs. Logo based on the Vanic boar created by Vanatru Priestess Ember of the Vanic Conspiracy (Ember was interviewed on episode 7). Studio recordings by Zencastr and Audacity.